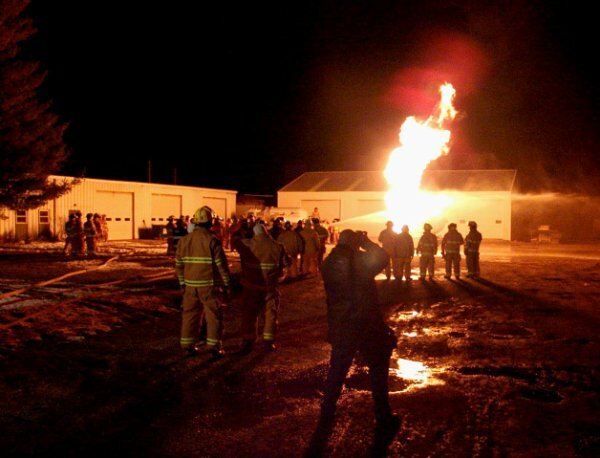 Above, groups of firemen from more than a dozen area fire departments take their turn in extinguishing an LP Propane tank which was ignited by state certified trainers for the purpose of teaching firemen safety and technique needed to extinguish a fire of this nature. The LP tank provided by Riverland FS, was situated on land of the Henderson County Highway Department just west of Stronghurst-Monmouth Implement Co. near the MST Fire Department, host of the event. Ninety to hundred firemen and several emergency personnel took part in the training which was arranged by MST Training Officer Scott Ford, one of 4 Assistant Fire Chiefs for the MST Fire Department. Firemen came in the afternoon for classroom training and were fed a hearty pulled pork meal before taking part in the on-hands training. Ambulance EMTs were also in attendance from Roseville, Stronghurst and Biggsville.